March 7, 2018 8:32 p.m.
Gilet, the gentleman’s vest; evolution of the three-piece suit has seen the three-piece suit make it’s debut over time. Men’s fashion trends have evolved throughout history, just like women’s. In fact, menswear has been a much larger focus within the fashion industry during recent years than in the past. Personally, I love that men have been more focused on clothes as well as more options. The three piece suit has been a go-to style for men throughout history, and much like other classic pieces, it’s evolved over time. History shows that the original inception of the three piece suit dates back to the 18th century. Vests became a commonly worn garment for both men and women during this time. Men and women wore very similar clothing at this point; however, by the 19th century a shift in clothing took place because of the French Revolution and the technology advancements that came along with it. Waistcoats were a significant garment for menswear prior to the 18th and 19th century, but with the adaptation of the three piece suit came a large focus on vest (also known as waistcoats). Men eager to be considered fashionable began to build a large collection of waistcoats in different fabrics, styles and details. In the late 1700’s waistcoats started to become known as Gilet and began to include detailing, like embroidery. During the 1800’s men’s suiting experienced another evolution, with the introduction of long trousers. 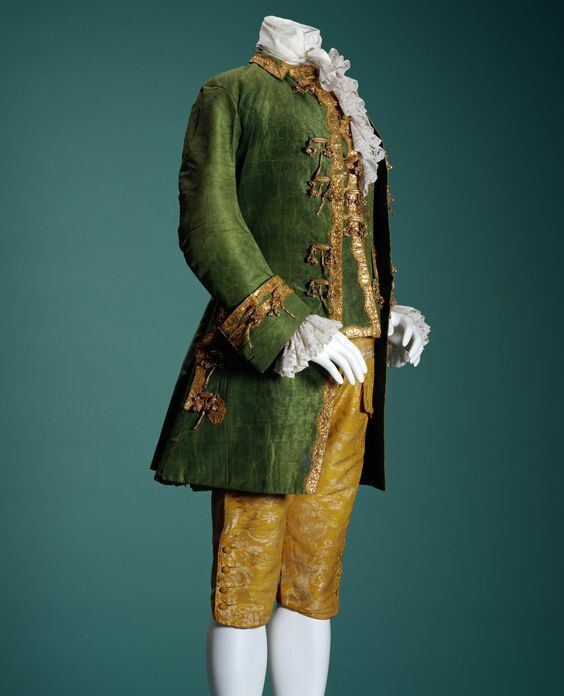 Prior to this, men’s pants were much shorter in length called ‘breechers,’ or habit à la française, which consisted of a jacket, breeches and a vest. Once pants became longer, suspenders made their way into the suiting realm of menswear, as an added accessory detail. During the 18th and early 19th century most men wore embroidery and silk garments but it was around the mid-19th century that luxurious fabrics previously worn began to be replaced with wool fabrics. As you can see, as the 19th century rolled around men’s suiting became much more similar to the three piece suits we see men wearing today. The last major evolution that occurred in men’s suiting was again during the 19th century with men’s coats. Prior to the Revolution men commonly wore long dress coats or waistcoats alone. After the Revolution, jackets became less dress like were replaced with more structure and shorter lengths and were worn with form fitting vests underneath. The new style of coat was referred to a frock coat and is very similar to the suiting coats men continue to wear to this day. Three piece suits have experienced quite the evolution since their inception and continue to hold their own in menswear today. I don’t know about you, but I’m excited to see where three piece suits go from here!